The National Association of City Transportation Officials’ Urban Street Design Guide marks a big step forward in advancing a people-oriented approach to transport policies. Photo by University City District. Urban streets are getting a makeover. In many cities worldwide, bike share stations have usurped parking for private vehicles. Protected bike lanes are replacing traffic lanes, while the unwieldy, barren intersections of yesteryear are being reinvigorated as vibrant plazas for people. After a prolonged period in which city streets were essentially designed to process cars much like sewers were designed to handle sludge, the face of city streets is finally changing. In the new Urban Street Design Guide, the National Association of City Transportation Officials (NACTO) cements these changes, codifying the emerging paradigm of streets as public spaces for people, rather than solely as arteries for traffic. The product of an unprecedented collaboration between major city transportation departments across the United States, the guide uses a dynamic visual interface to showcase how streets can be redesigned to be safe, livable, and supportive of economic activity and development. The Urban Street Design Guide emphasizes street facilities ranging from boulevards to neighborhood streets, and transit corridors to green alleys. 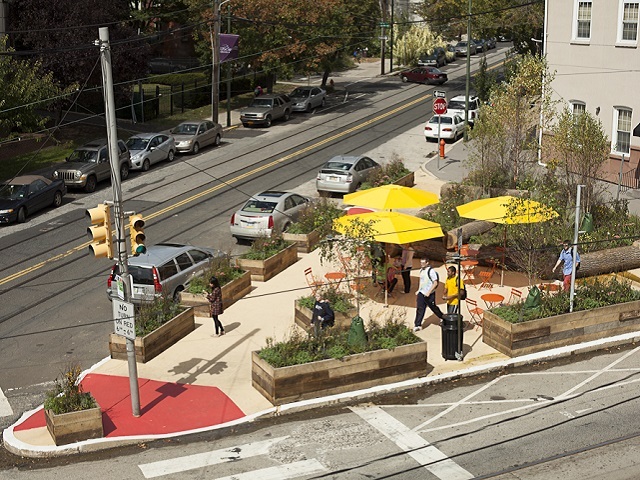 A toolkit for planners, engineers, and designers, the guide features widely accepted traffic calming strategies, like curb extensions and narrower travel lanes, as well as emerging tactics, such as bioswales and parklets. It integrates innovative concepts for all street users, including cycle tracks, dedicated busways, and pedestrian safety measures. Drivers aren’t left out either, as the guide details how to make intersections work better for everyone, including motorists, through the addition of turn lanes and signal timing evaluation. Finally, the guide highlights case studies from across the U.S., including Cleveland’s bus rapid transit corridor on Euclid Avenue, New York’s public plaza program, and Los Angeles’s CicLAvia, to demonstrate how innovative street design techniques are being implemented on the ground. Although NACTO’s focus is on cities in the U.S., healthy competition to raise the bar in urban street design is ongoing at a global scale, and this guide is a useful tool for municipalities everywhere. “Design for safety” is essential to creating streets that protect all users from collisions and injury. Intersections, as the sites of the most serious conflicts between pedestrians, bicyclists, and motorists, require careful attention. Innovative design strategies addressing crosswalks, corner radii, and signal timing can be implemented to improve intersection safety. “Act Now!” refers to the potential for an “interim” or pilot project delivery method to achieve quick results and near-term benefits. A growing number of cities are exploring the use of temporary street retrofits to test visionary projects. Made famous by New York City’s Times Square redesign, which created a temporary pedestrian plaza before undertaking a permanent reconstruction of Broadway, these interim design strategies are based on the principle that an initial implementation using low-cost, temporary materials can help a city better evaluate a project’s potential impacts in the near term while building support among communities. Interim materials can be replaced by a permanent reconstruction once funding is available and the design is fine-tuned. NACTO is an association of 16 major U.S. cities formed to exchange transportation ideas, insights, and practices and to cooperatively approach national transportation issues. The member cities are Atlanta, Baltimore, Boston, Chicago, Detroit, Houston, Los Angeles, Minneapolis, New York, Philadelphia, Phoenix, Portland, San Diego, San Francisco, Seattle and Washington, D.C. In the words of Janette Sadik-Khan, President of NACTO and Commissioner of the New York City Department of Transportation, the Urban Street Design Guide provides “a toolkit for cities to create safe, multi-modal streets that meet the needs of all users, providing an alternative to existing design books that treat city streets as mini-expressways.” Available to be adopted or endorsed by individual cities, states, or counties, the guide marks a big step forward in advancing a people-oriented approach to transport policies.